Anthem was published in the United Kingdom in 1938, but the U.S. edition was delayed until 1946, following the success of The Fountainhead . Anthem is Rand's Dystopian story about a new Dark Age in which technological advances are carefully planned, and individualism is suppressed. "I" has been replaced by "we." A young man known as "Equality 7-2521" is caught conducting secret science research, he and his girlfriend escape to the forest where they hatch a plan to create a new society based on individualism. Rand expanded the work into a novella; her original intention was as a screenplay. Part Eleven - I am. I think. I will. 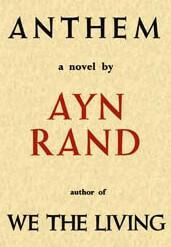 Return to the Ayn Rand library.